Your tooth really hurts. Your jaw and gums are swollen, plus you have a nasty-tasting drainage coming from the area. You worry that your Weatherford dentist will pull the tooth. Don’t be concerned. You may qualify for root canal therapy, a traditional, two-visit restorative procedure which heals infected, injured or deeply decayed teeth for years of additional service. Dr. Deborah Romack and Dr. Garrett Mulkey perform comfortable root canal therapy at Cosmetic & Family Dentistry in Weatherford. A reliable restorative procedure, root canal therapy, or endodontics, saves literally thousands of teeth annually in the United States. It is a safe restoration which heals infection and protects remaining healthy tooth structure. While many people think of it as lengthy and painful, the treatment is relatively short and relieves pain and other distressing dental symptoms. The dentists have compiled some frequently asked questions about root canals. Read their informative answers here. 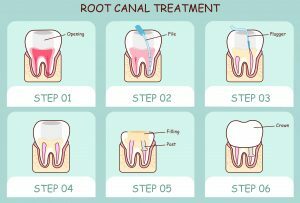 What is a root canal? A root canal is one of up to four interior chambers located in dental roots. Containing blood vessels, nerves and connective tissue, root canals become infected when a tooth has deep decay or has been injured in some way. The dental procedure is actually called root canal therapy. It removes the infected pulp and crowns the tooth to protect it and restore its appearance. Who gets root canal therapy? People who have developed a dental abscess or have a severely fractured or decayed tooth need root canal therapy. The treatment is an excellent alternative to extraction and allows the patient to bite and chew normally. Where does the dentist perform a root canal? Mulkey or Dr. Romack do these procedures right in the dental office, usually with simple local anesthesia to numb the area. The dentist performs a complete oral exam and takes digital X-rays to be sure endodontic therapy is the appropriate treatment. What’s involved in the treatment? After numbing the area, the dentist places a protective dam around the tooth. He or she drills a small hole into the root canal and extracts the infected material with a series of small files. The dentist also adds antimicrobial medication to the canal. The process is repeated for the other chambers, and the dentist seals the tooth with rubbery gutta-percha. A temporary filling finishes the treatment. After healing, the patient returns for placement of a porcelain crown. How long will the tooth last? A tooth treated with root canal therapy may last for decades. The patient must brush twice a day, floss daily and receive professional cleanings and oral examinations every six months. If worried about the condition of a tooth, or if you have a toothache, please don’t wait. Contact Cosmetic & Family Dentistry in Weatherford immediately for an appointment. The friendly and professional team will make you comfortable and work hard to save your tooth. by: Dr. Deborah Romack at October 17, 2016 .